Lightweave is a permanent public artwork located in Washington DC’s NOMA district. It translates ambient sounds from the city into dynamic auroras of patterned LED light. Slowly changing effects are activated by the noise and vibration of passing trains, cars and other sounds from the neighborhood. Lightweave animates the underpass and creates a meditative and interactive urban experience. The artwork consists of six 65’ long curvaceous sections (390’ total) of suspended stainless steel and LED lattices. Each section contains 26 computer-controlled LED modules. The artwork is mounted ~11’ above the sidewalk on a steel column and beam structure that does not touch the underpass above in any way. Sensors embedded a various locations in each section feed information to a computer which triggers variable and overlapping responses from the LEDS. Typical sound events in the immediate area range from 50dB+ (passing automobiles in the tunnel) to 100dB+ (train horns). Lightweave translates these sound events into fluid wave patterns of light. Similar to dropping a single pebble into an undisturbed pond, waves of light slowly oscillate through the Lightweave. Multiple sounds will create dynamic visual overlaps. The quality and placement of lighting elements will enhance safety and comfort. 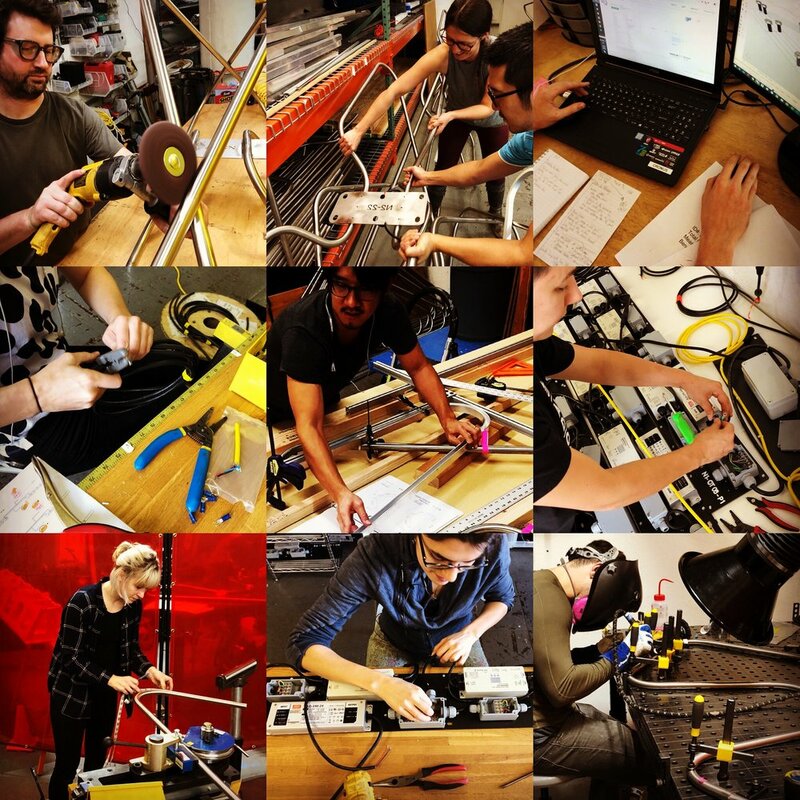 Artist’s Design and Fabrication Team: Jeff Maeshiro, Joel Frank, Carlos Sabogal, Emily Saunders, Nat Abbott, Brian McKinney, with Ji Ahn, Fernando Amenedo, Ripon DeLeon, Collin Schupman, Laura Dell'Anno. Electrical Contractor and Installer: MC Dean; Structural Engineer: Endrestudio, Oakland / Chicago; Structural Steel Fabrication: American Metal Fabrications, Richmond, VA; Electronics Consultant: Maramoja, NL. Primary Materials: Stainless Steel (Lattices and Cable Trays), Aluminum LED Channels, Galvanized and Epoxy Painted Carbon Steel (Structure), Various sensors and electronics. Commissioned and Maintained by: NOMA Parks Foundation, Washington DC; Owner: D.C. Commission on the Arts and Humanities.